Marlborough’s Sarah Popivchak smacks a single in a game against Shepherd Hill. 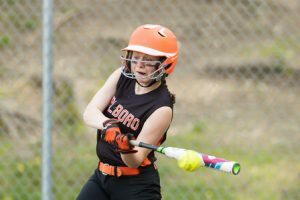 Marlborough – The Marlborough High School Panthers softball team fell to the Shepherd Hill Rams by a score of 7-5 in a game played on May 16. 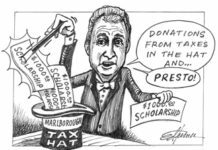 Marlborough jumped out to an early 3-0 lead in a 5-hit attack in the bottom of the first inning. Shepherd Hill scored two in the fourth, three in the fifth and two in the sixth. 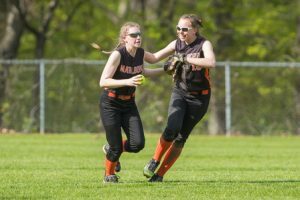 Marlborough got one back in the fourth inning, and another in the final frame as Jill Petrie tripled. Sarah Popivchak, Kim Konar and Petrie each had two hits for Marlborough. Olivia Larson struck out six over five innings. Marlborough falls to 6-6 on the season with the loss, while Shepherd Hill improves to 8-6. 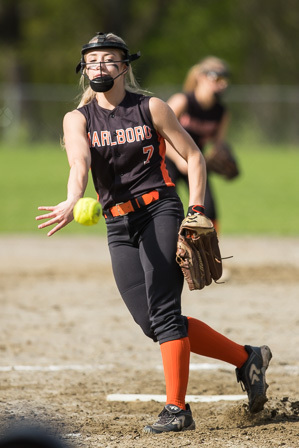 Marlborough’s Olivia Larson delivers a pitch in a game against Shepherd Hill. 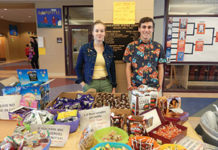 Kim Konar (right) congratulates Kayley Cote after she made an over-the-shoulder catch.